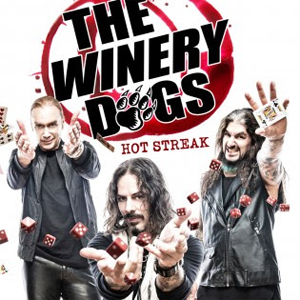 THE WINERY DOGS - featuring Richie Kotzen (lead vocals/guitar), Mike Portnoy (drums), Billy Sheehan (bass) - will launch a new US headlining tour on Saturday, June 25th in Hinckley, MN at the Grand Casino Amphitheatre. The band are on tour in support of the self-produced album, Hot Streak, which was released in North America in October 2015 via Loud & Proud Records. To get fans revved up for the new tour, the hard rocking trio is releasing a new single, “Captain Love”, to radio on June 3rd. A Vicente Cordero-directed video for the song can be seen on KNAC.COM right HERE. “Captain Love” is one of the band’s favourite songs on the album. While lyricist/singer/guitarist Richie Kotzen doesn’t confess to be the subject of the song, drummer Mike Portnoy believes it’s the perfect groove to be played in strip clubs around the world. "Eight months after kicking off our 1st US leg last October and following runs in Europe, Japan and South America,” explains Portnoy, “we are excited to round home plate and return home with some more US shows in June and July."